We’d love your help. Let us know what’s wrong with this preview of Tiger Queen by Annie Sullivan. To ask other readers questions about Tiger Queen, please sign up. Tiger Queen presents Kateri, a Princess of Kingdom Achra surrounded by a Desert. Kateri yearns to become the best Warrior in her Kingdom, not just because she desperately seeks her Father's approval, but also because she wants to become the ruler and by consequence, to be free to make her own choices. To do that she has no choice but to fight in the arena. Kateri wins against almost all of her opponents in the arena, but the last one is someone who is a much skilled, stronger fighter than her, so she has no choice but to ask for help to someone she did not want to. There's also an issue going on with the Desert Boys, a group of outcasts, and children that steal water from the wells and the punishment by law is death by the tigers that the King owns. To end her last combat she will do everything, even if it means to get to know her enemies. So it begins a journey that will inevitably change her perceptions and beliefs. I really liked Kateri: she was strong, not just in fighting skills but also, strong-willed, with a strong mind. I enjoyed the mythical world and the wonderful Desert descriptions. I never had heard about the Lady and the Tiger and I was glad the author did a retelling, otherwise, I would have perhaps never known anything about it. However, everything else, every character but Kateri was underdeveloped. Villains were predictable and "villainized" to the core, nothing they did surprise me. It disappointed me the overused villain tropes. Not one single twist in the whole plot that would keep me guessing. From early in the book you already know who are the villains and how they will act. You already know who are the friends and foes and the "secrets". I'm a sucker for complex characters so it disappointed me a bit. The fighting scenes were written particularly well and Kateri was a good character. The author has a really clear, flowing writing style. The mythology/traditions/culture/animals the author created was really nice (except for the gross Desert food). The romance contains one of my absolute favorite tropes and it was sweet, clean and slow-burn which I appreciated....but it suffered from misunderstandings. Cion was a bit of a contradiction: he was supposed to be the "best of all fighters" and yet he wasn't??? Anyway, I enjoyed watching Kateri's evolution from the beginning to the end. So, in conclusion, Tiger Queen was an okay read for me. It was enjoyable but not amazing. I received an e-ARC of this via Edelweiss! I'm so excited to read it! Loved A Touch of Gold, I'm completely here for anything that Annie puts out. ARC received in exchange for an honest review - thank you! The writing was pretty good, but the story just felt too simplistic for me to really get behind it. The villains were very villainous, the good guys were very good... the only exception is the heroine, who starts out delightfully conflicted, but quickly sees the error of her ways (and thus loses my interest). An uninspiring love interest seals the deal. Honestly, this is probably more of an 'it's not you, it's me' thing. [Blog] - [Books ARC received in exchange for an honest review - thank you! So while I defiantly figured out the way this was going to go (I never read the book or short story it was based off) I really enjoyed it! The short story, "The Lady or the Tiger," has been one of my favorites since I read it in high school. It is one piece of literature that has stayed with me since. I've gone back and forth in my mind for many years wondering which door was chosen. Reading Tiger Queen was like visiting a friend from long ago! Annie Sullivan put a new, but believable, twist on this story. I cannot wait to recommend this book to my high school students who have read the short story. A combination of mystery, advent The short story, "The Lady or the Tiger," has been one of my favorites since I read it in high school. It is one piece of literature that has stayed with me since. I've gone back and forth in my mind for many years wondering which door was chosen. Reading Tiger Queen was like visiting a friend from long ago! Annie Sullivan put a new, but believable, twist on this story. I cannot wait to recommend this book to my high school students who have read the short story. A combination of mystery, adventure, and a little romance makes this a great read. And now I know "The Rest of the Story!" I am looking forward to reading more from this author! While Annie Sullivan's previous book A Touch of Gold was a miss for me, I'm looking forward to exploring this new world. It's also based on "The Lady, or the Tiger?" a short story by Roger Stockton (a favorite), and involves an arena/fighting concept that I am HERE for. Thanks to Blink via NetGalley for an ARC of this title in exchange for an honest review. Serethiel ☽ ✨ Lisa Elis wrote: "OH MY WORD AAAHHHHHH I NEED THIS"
after A touch of gold wasn't like. Greek. at ALL. this seems like a poor idea. a ruler must fight gladiatorially to prove herself fit for her kingdom?? I received an e-ARC of this book from the publisher via NetGalley in exchange for an honest review. In the mythical desert kingdom of Achra, an ancient law forces sixteen-year-old Princess Kateri to fight in the arena to prove her right to rule. For Kateri, winning also means fulfilling a promise to her late mother that she would protect her people, who are struggling through windstorms and drought. The si I received an e-ARC of this book from the publisher via NetGalley in exchange for an honest review. I love retellings of classic stories. There’s something fascinating about familiarity mixed with a new spin. Tiger Queen is a retelling of The Lady, or the Tiger by Frank Stockton. Before I read this, it reminded me of a dangerous game of Let’s Make a Deal (that reference might be too old for some readers 😉). In both stories, the basic idea is that there are two doors, behind one, is a tiger, ready to devour the criminal, behind the other, is a prize of sorts, representing freedom. Justice is in the hands of the criminal and theoretically, freedom is always on the table. Cion – it was obvious (to me at least) from the beginning of the story that the Desert Boys were a vilified group who were actually trying to help the people. Kateri had been blinded by her Father and Roderic’s ideas about them. I thought Cion was too good for Kateri (at least in the beginning of the story). She was pretty bratty about her kingdom and how dare they steal from her (and the usual nonsense someone who is brainwashed spouts). But even after, she was still pretty cold. Cion, however, was trying to teach her about family, love, and working together, despite how Kateri acted. In my opinion, it took too long for Kateri to realize how good he was. So glad this didn’t end like the original story (I hate cliffhangers). I really did like the ending. In the desert kingdom of Achra, weakness is not tolerated and no one knows this better than Princess Kateri, who must prove her worth in the arena and win the right to rule. Her father distant and harsh like the desert has made Kateri train her whole life for this moment and she is determined to win and keep her promise to her deceased mother to look after their people. However, this desire is thwarted time and time again by the desert boys - outcasts, who killed Kateri's mother and steal water In the desert kingdom of Achra, weakness is not tolerated and no one knows this better than Princess Kateri, who must prove her worth in the arena and win the right to rule. Her father distant and harsh like the desert has made Kateri train her whole life for this moment and she is determined to win and keep her promise to her deceased mother to look after their people. However, this desire is thwarted time and time again by the desert boys - outcasts, who killed Kateri's mother and steal water from the drought plagued kingdom. Driven to win and find fight against the desert boys, Kateri is betrayed by those close to her and turns to the desert for a solution. Here, Kateri learns that her father's kingdom is not what it seems and that she has lived in ignorance for her entire life as her greatest foe turns out to be an ally. There are some aspects of this book that I really enjoyed. I for one am a huge fan of books that feature arenas. Kateri in order to win her throne must fight a suitor each month for an entire year. The book opens with her first fight against a potential suitor and afterwards, her father announces that his trusted captain of guard will be the final one. He is much more skilled father than Kateri, who knows she will lose against him. Determined to win, she escapes into the desert to learn from the leader of the desert boys, Cion, who's fight ability is legendary and people whisper that he can split a rice grain in half when thrown into the air. Cion agrees to train her because he wants to end the oppressive regime of her father and believes that Kateri is the best way to do this. As she trains, Kateri finally realizes that the desert boys are not the enemy she made them out to be and that her father lied to her about many things. The synopsis promises fast-paced action in a sand-swept fantasy setting, and it delivers on those counts. If you came for arena fights, plot twists, and romance, you’ll find what you’re looking for. Sullivan is at her best writing moments of high energy and intensity, like fight scenes or turning points of discovery, and there were some interesting elements to the mythical kingdom she created. That said, this book was not for me. Full review can be found here. This is certainly due in part to how The synopsis promises fast-paced action in a sand-swept fantasy setting, and it delivers on those counts. If you came for arena fights, plot twists, and romance, you’ll find what you’re looking for. Sullivan is at her best writing moments of high energy and intensity, like fight scenes or turning points of discovery, and there were some interesting elements to the mythical kingdom she created. This is certainly due in part to how much YA I read. There have been so many recent titles with badass princesses in gritty fantasy kingdoms, and it’s hard to see what makes Tiger Queen noteworthy. Even if I hadn’t read much in the genre, though, I expect I would still have found the characters thin and the story predictable. The whole thing is just too flimsy for me. Tiger Queen is inspired by Frank R. Stockton’s 1882 classic short story, “The Lady or the Tiger.” You can read the story here, but be prepared for some old-timey orientalist racism. Sullivan does a great job transforming the short story into something original and fleshed-out while still staying true to the central tension of the source material. I love what she did with it, but I wonder if Tiger Queen might have been better served sticking to the short format. I think it would have made a sharp, snappy novella or short story. I've been meaning to pick up A Touch of Gold by Annie Sullivan, but I'm on a book ban! So, I was excited to receive this book to review instead. Especially since the premise interested me. A Princess fighting in an arena, proving she's worthy to rule her kingdom? Absolutely! But more than that—add in the fact the people are being deprived of water and there are rations put in place. Everything about this book promised a great read, but did it deliver? In some ways, yes, it did. Princess Kateri is naive and has been sheltered by her father to keep her shielded from the truth. He is a cruel man, which is no secret, but Kateri is so blinded to it, which allowed her character to grow immensely. She is strong willed, strong of mind, but her character still fell somewhat flat for me. There was a disconnect while reading, and I'm not sure why. There was action—a ton of action—which kept the story moving, but because there was so much action I felt withdrawn from the deeper parts of the story. There were some aspects I wished were more fleshed out, more politics with the palace, less training, more experiences in the desert. Wowzers. My adrenaline was pumping during this entire book. Whoowee! It had gladiator schtuff in it, and I am a sucker for gladiator themes. Kateri was super cool. In fact, pretty much every character was cool. The action was super intense and that climax. Mm! Yesh! SO COOL. The writing was very sensible, and to the point and the world building was amazing. The writing really sucked me in. When the characters were sweaty and thirsty, I wanted to drink some water. I found how people survived the Wowzers. My adrenaline was pumping during this entire book. Whoowee! It had gladiator schtuff in it, and I am a sucker for gladiator themes. Kateri was super cool. In fact, pretty much every character was cool. The action was super intense and that climax. Mm! Yesh! SO COOL. The writing was very sensible, and to the point and the world building was amazing. The writing really sucked me in. When the characters were sweaty and thirsty, I wanted to drink some water. I found how people survived the dangers of the desert and even managed to make a home in it interesting. And can I just say again how amazing that climax was? Wow. The imagery was vivid and colorful, the characters awesome, the action fast-paced. This book kept me on the edge of my seat! Violence was prevelent throughout the book, but for the last part, not too detailed. Plenty of stabbing, choking, beating, mauling, and the like. Mentions of torture.There was one description of a servant who got attacked by a tiger and that was a little gross. The sexual content: Low. There were a few suggestive comments but weren't especially descriptive. There was one enthusiastic kiss. Language: None, from what I can remember! Thank you to Blink and NetGalley (and Edelweiss) for a digital ARC of this book. First of all, the character building in this book is fantastic. I couldn't stand Kateri and her oblivious and spoiled nature. However, she evolved so much throughout the book and understood her people's struggles as she soon began to live them. The change was wonderful to see and I felt like it taught a great lesson. We don't know how much other people struggle until we are in their shoes. She also was fierce and br Thank you to Blink and NetGalley (and Edelweiss) for a digital ARC of this book. This novel was a great read! I could not put it down! Ms. Sullivan weaves an excellent tale. The story is it’s own and brings in a choice, which door to choose where one is freedom and the other , the tiger. Not all is as it appears in the kingdom of Achra. People are suffering from water rations due to a drought. The Desert Boys are stealing the water. Princess Kateri believed many things about what she had been told until her l I received this novel from net galley and the publisher. Thank you! This book was received as an ARC from Blink in exchange for an honest review. Opinions and thoughts expressed in this review are completely my own. 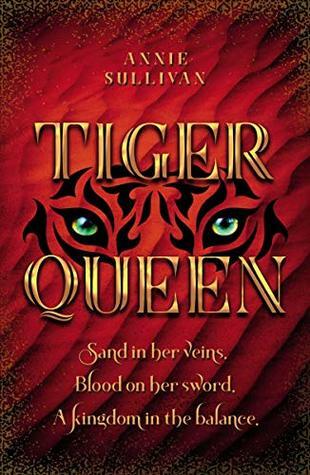 Tiger Queen is an invigorating book to read that reminded me a lot of the Disney movie Brave fighting to keep the crown and sacrifice everything she knows for what is rightfully hers or she will lose it to a man of the other Kingdom. Also, I think a lot of people will relate to Kateri's passion and love for her family and her people especially after t This book was received as an ARC from Blink in exchange for an honest review. Opinions and thoughts expressed in this review are completely my own. Tiger Queen is an invigorating book to read that reminded me a lot of the Disney movie Brave fighting to keep the crown and sacrifice everything she knows for what is rightfully hers or she will lose it to a man of the other Kingdom. Also, I think a lot of people will relate to Kateri's passion and love for her family and her people especially after the death of her mother the Queen of Achra. Having the kingdom on her back is a lot of pressure for Kateri and when she is forced to make the ultimate sacrifice, her bravery and devotion to her people will be an inspiration and motivation to others especially young women. 4.5 stars for this wonderful story. In a world where duologies and series dominate, it is so refreshing to find a good standalone book. This book is really well written and beautiful. I found it to be very poetic in its own way, and I loved the story. It’s almost like Jasmine from Aladdin meets Peter Pan in the desert. Just a really great action packed YA novel. This book was fast paced and thrilling from beginning to end. Tiger Queen is beautifully written and captivating. Annie Sullivan keeps you guessing throughout the book. I loved all of the characters in this book and found myself rooting for them until the very end. I highly recommend this book to any fantasy reader looking for a fresh new take on a fairy tale retelling. Starting out, I struggled to get into the book. It took until about chapter 6 for me to really start getting enthralled. This was a book that towards the end, had my heart beating faster and faster. I loved the characters especially Kateri and Cion. Overall, a great read! This book was decent. the fight scenes were good. The plot twist really didn't surprise me that much. I enjoyed this book but wouldn't read it again. Thank you to Netgalley and Blink! Arc request approved. So freaking ready! I did like the book overall but not going to lie, it didn’t stun me. Firstly, the plot was pretty straightforward. While I liked the twist on the Lady or the Tiger tale, the plot didn’t have any big twists or anything to surprise the reader. So it reads like a pretty straightforward fairy tale. Not bad, but a bit lukewarm for such an exciting premise. Really, this book could have been amped up in so many ways. For example, I was totally let down by the romance. For two people who are supposed to end up digging each other, the two main characters don’t have a lot of zing moments throughout the book. I’m all for a slow burn romance but there should still be zings you know?!? But nary a zing or spark was found and so when things finally did heat up, I just wasn’t that invested. This probably is a side effect of me reading too many steamy romances…I’m used to a lot of sparks and teasing to get to the good stuff. But this book? No sparks and the good stuff ain’t that good.